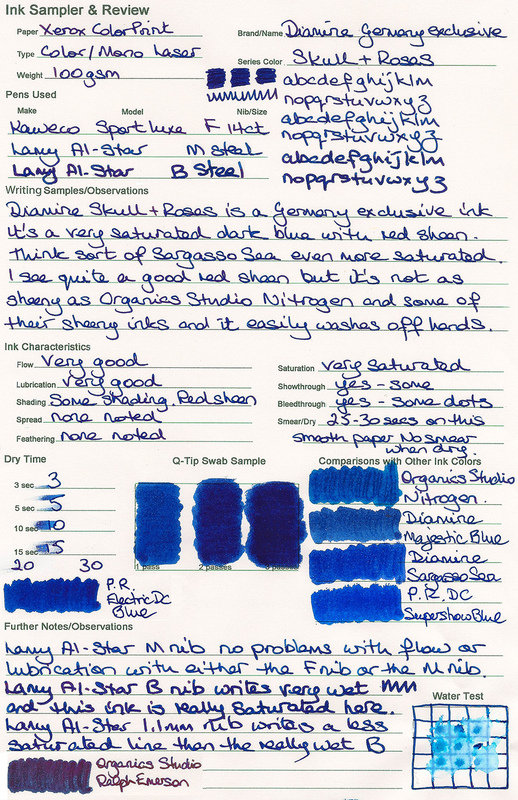 Today I'm reviewing Diamine Skull & Roses ink. Diamine Skull & Roses is a Diamine Exclusive ink made specially for sale in Germany. I’ve seen it for sale on “Fountainfeder” and on “Papier & Stift” websites as well as on Amazon. I only have a sample bottle, so I can’t post a picture of the 80ml glass bottle. It’s a very good blue colour, whether you can always see the red sheen or not. It dried quite quickly on most reasonably absorbent papers and once dry it didn’t smudge or smear. I tested for this by rubbing repeatedly across my writing. I saw no blue or red on my fingers, and no smudging on the page. I really enjoyed writing with it. However, I tend to use more blue inks than any other colour. With these high sheen inks showthrough and bleedthrough can be a problem. 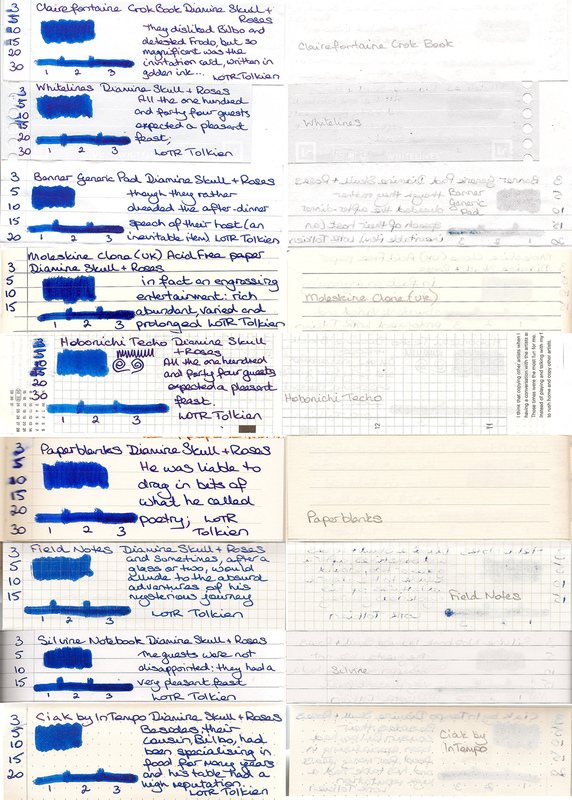 There was showthrough on several of the papers I wrote on, but I could still have written on the reverse of some of them. The red sheen is usually more visible when using pens with wetter flow and broader nibs. Shading Potential: Some shading with finer nibs. Banner Generic 80gsm lined pad. Hibonichi Techo: Tomoe River 52gsm - Slight. Spread / Feathering / Woolly Line: Seen on some papers with wetter B nib. Water resistance: Not sold as waterproof but has some water resistance. Availability: Exclusive to Germany available from: Papier & Stift, Fountainfeder and Amazon. Chrissy--thanks for the lovely review. 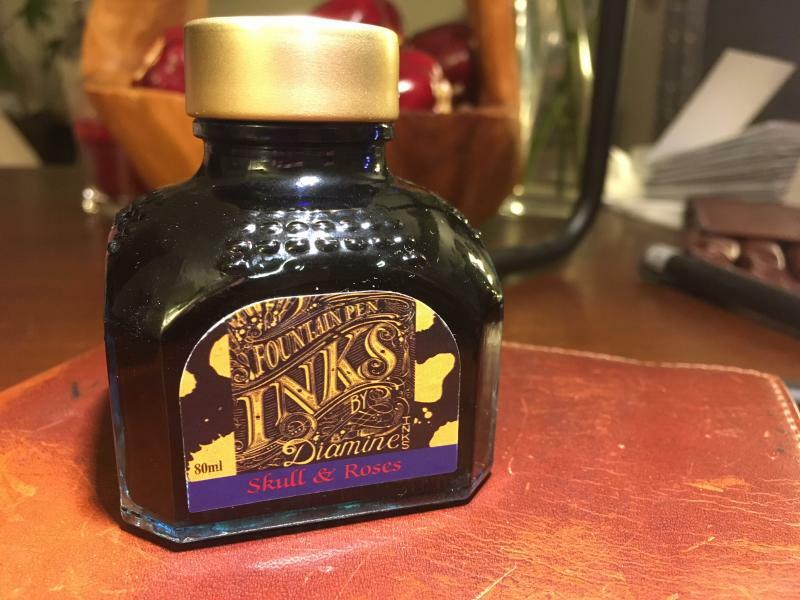 Unfortunately, Fountainfeder is out of Skull & Roses, and Papier & Stift wants €80 for shipping of only two bottles of ink! That is right out (to quote the Liturgy of the Holy Hand Grenade)! Here's a picture of the bottle for ya'll, but I tossed the box. I'm only somewhat ashamed to say I let a German stationery store rob me to have this ink shipped to Toronto. It's been a joy to use and agree that it's fairly close to Sargasso Sea at it's roots. Maybe a tad darker with a well behaved sheen. I just finished playing with O.S Nitrogen and was disappointed at it's constant dry starts in an otherwise well behaved pen. None of that with Skull & Roses. Edited by bemon, 15 August 2018 - 01:45. In my experience, Fountainfeder refills the store continuously so be patient. I had to wait for some two or three weeks in July until I was able to order Skull & Roses and November Rain. You may also ask by the owner what to expect, she responses quickly. Thanks for the review, Chrissy, but the colours look a bit shifted to my eye. You're welcome. That's a real shame about the stockists having such different rates to ship from the same Country. I currently have pens inked with Diamine Jalur Gemilang, Skull & Roses, O.S. Nitrogen and Ralph Emerson. I have hard starts with both O.S. inks, but none with either of the Diamine inks. They aren't all the same pen types, so it's by no means a controlled experiment, but I'm perfectly happy to go with slightly less red sheen if the pens start straight away and the inks wash off of my hands so easily. You're welcome. This one was very easy to match the colour on my screen with the ink on the paper. I got mine via Amazon UK. €80 for shipping they'd better hand-deliver them to you! I didn't know about "FountainFender". Checked out their site and ordered a few samples as well as a small bottle of November Rain. I can't believe I paid so much for shipping from Papier & Stift! Granted they shipped with lightning speed which is the next best thing to a hand delivery, but Fountainfeder shipped at.. wait for it.. a whopping $4 CAD. I can't get sH!t shipped that cheap INSIDE Canada let alone internationally. Is this ink a Grateful Dead tribute? Edited by torstar, 15 August 2018 - 14:34. Couldn't tell ya- I don't know the reference! I know who Grateful Dead are, but probably wouldn't know them to hear them. Bargain shipping price. Good for them. To their defense: They are quite a small and still new-ish business, so they may not be equipped to ship internationally, hence the insane costs for international shipping as there is no way for them to balance out transportation costs. Well shipping is shipping. They could be marking it up to make margin, but I don’t feel like that’s playing nice. I wouldn’t want order again now that I’ve learned. At any rate, they did fulfill the order quickly and efficiently, and the order arrived professionally and securely packaged. So they left me with a fairly good impression aside from shipping costs. It's still available on Amazon.co.uk but, when it's in stock, comes out slightly cheaper from FountainFeder.eu especially if you buy 2 x 80ml bottles. I'll be in Berlin in a few weeks and will be looking for it. Thanks for the review. Amazingly it will be my first Diamine ink. You can definitely get it at Moranga in Berlin. If you are unsure if it is in stock then maybe call them to ask for a bottle to be kept for you to pick up. While you're there I recommend you check out Diamine November Rain and Calligraphy Green, the other Germany exclusives. I've asked FountainFeder to notify me when they get more Skull & Roses in so I can order it along with the November Rain.